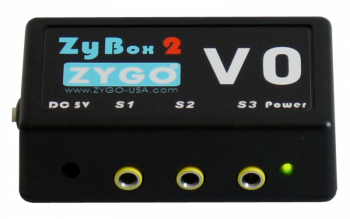 ZyBox 2-VO (L) is a three-switch input adapter that allows you to use control switches to operate iOS devices through VoiceOver commands. 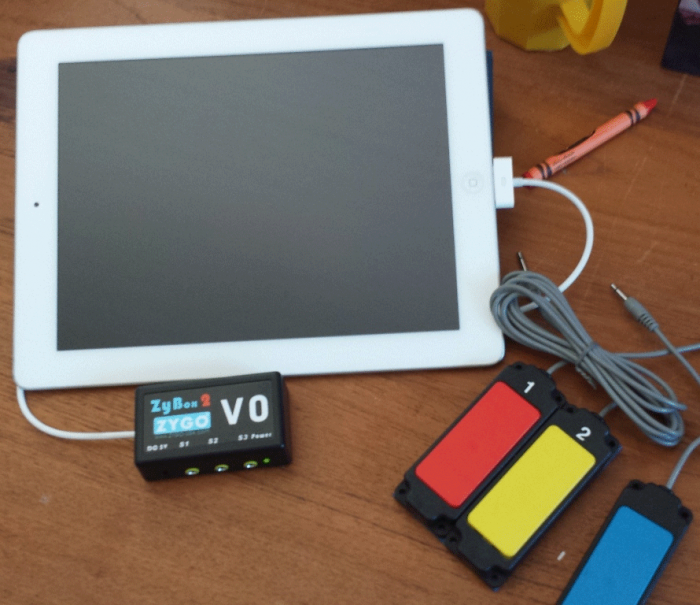 The ZyBox 2-VO is an easy way to use control switches to operate your iPad or other iOS device. 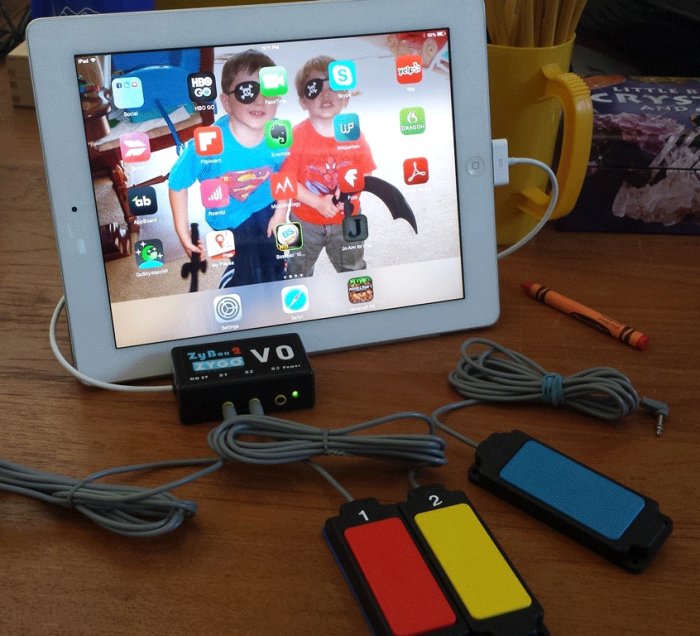 Connect the ZyBox 2-VO to your iPad using the 30-pin or Lightning connector, snap in one, two, or three control switches with 3.5mm plugs, and you have access to the entire iPad and any or all apps that are compatible with the iOS Voice Over (VO) commands. The ZyBox 2-VO has two modes to operate your iOS device: auditory queuing of available Voice Over commands, and a secondary keyboard mode to allow you to send keyboard strokes as required on some apps. When the ZyBox is plugged into your iOS device, it will power up as indicated by the LED. It will automatically recognize the mode based on the number of switches it identifies as plugged in. 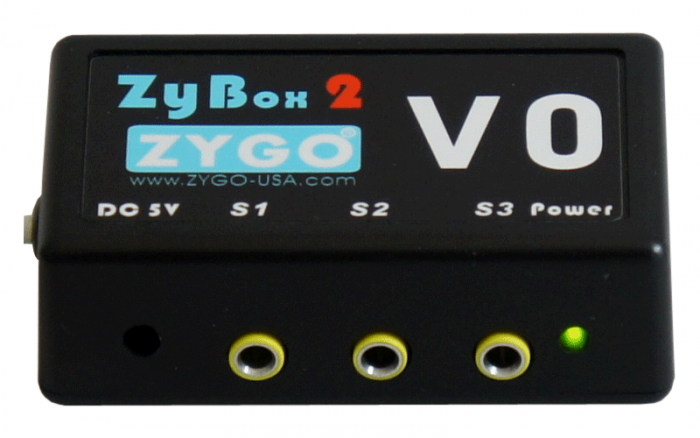 If you plug in Switch 1 and Switch 2, the ZyBox 2-VO knows that you are in two-switch mode. A list of available Voice Over commands is provided with the ZyBox 2-VO so you can easily see what each switch does when pressed. In some cases one switch is used to send more than one command based on the length of time the switch is held down by the user. The individual presses and holds the control switch and listens while the device speaks each Voice Over command in sequence. When you hear the action you want to perform, release the switch and the last command spoken with be performed. Since you use the 30-pin and Lightning connectors to plug the ZyBox 2-VO directly to the docking connector of the iOS device, the Bluetooth connection is still available to do other things, like connect to a Bluetooth speaker, a keyboard, or to a mobile phone. It also means that the ZyBox 2-VO pulls very little power, unlike Bluetooth connected devices, so you will continue to enjoy long battery life. To set up the Voice Over on your iOS device, go into Settings, move to the General tab, choose Accessibility, and turn VoiceOver to the On position. You may also find benefit from changing the Visual Style to Largest so that you see the large outline surrounding your icons on screen.